They say driving is a privilege, not a right. Cars are meant to transport you from point A to point B, but accidents happen. Cars are powerful, and potentially dangerous, machines that weigh thousands of pounds. Driving recklessly or while under the influence can result in serious injury to the driver and/or the people around them. It is incredibly selfish and irresponsible to be intoxicated behind the wheel. 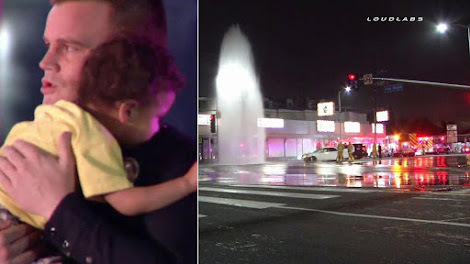 In Los Angeles, police were called to investigate a hit-and-run incident. A woman, who was later found to have been drunk at the time, had plowed her car into a fire hydrant. Rather than sit around and face the consequences of her actions, she fled. Police arrived on the scene and found her abandoned car surrounded by a mighty geyser of water. While inspecting the area, officer John Neal Cooke overheard one of his colleagues shout something disturbing. “I just hear someone yell to me, ‘There's a baby back here!,’" Cooke tells Inside Edition. The driver had thoughtlessly abandoned her two-year-old son. The little guy was left helpless in the backseat. When Cooke approached him, he was in hysterics, but what the officer does next will melt your heart. Don't forget to SHARE this touching story with your friends and family.